Scottie Lindsey sizes up the defense. The senior guard came off the bench for the first time this season Friday and led Northwestern with 22 points. 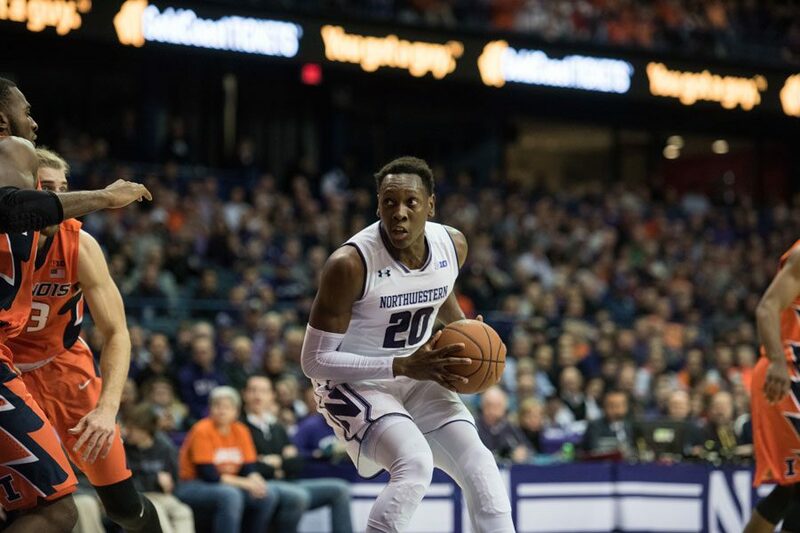 ROSEMONT — Northwestern pulled away in the final minute of overtime to earn a much-needed 72-68 victory over rival Illinois in its Big Ten opener Friday. Senior guard Scottie Lindsey made two free throws to give the Wildcats the lead with 59 seconds left in overtime, NU came up with two crucial defensive stops and sophomore guard Isiah Brown — pushed into action with three Cats players fouled out — made the game-sealing free throws with 2.1 seconds on the clock. Lindsey led the way with 22 points on 6-of-17 shooting, while junior forward Vic Law tallied 16 points and seven rebounds for NU and senior guard Bryant McIntosh added 14. Illinois (6-2, 0-1 Big Ten) led for the majority of the first half, getting the Cats (5-3, 1-0) in foul trouble early and forcing some poor shot selection, and carried a 36-32 advantage into the break. NU fought back to take a short-lived lead soon after halftime and the game remained a back-and-forth affair for the duration. A late charge call gave the Cats a chance for the final shot, but McIntosh turned it over in the waning seconds and regulation finished 63-63. 1. NU gets the strong finish it’s been looking for. Three days after a heartbreaking buzzer-beater loss at Georgia Tech, the Cats trailed for most of Friday’s game but came up with the clutch plays it needed in overtime. The victory puts NU at 1-0 in Big Ten play as it prepares for a road date at Purdue on Sunday. 2. Aggressive defense gives Cats trouble. Illinois kept McIntosh and Lindsey on their toes all night long with an aggressive, athletic perimeter defense. The visitors pressured NU well outside the 3-point line — sometimes even employing full-court pressure — and made pick-and-rolls tough to execute. NU overcame the Illinois defense thanks to a gutty performance from Lindsey and solid defense throughout the contest. 3. It was a de facto road game. A season-high crowd of 10,017 came out to Allstate Arena, but the majority were orange-clad Illinois fans taking advantage of the quick two-hour commute from Champaign. Roars for Illini baskets were consistently louder all night, a “Go U, NU” chant was drowned out in the first half, and the Cats’ players had to bear a more-hostile-than-not environment in Rosemont.